Welcome to the UVM Ecological Design Collaboratory! 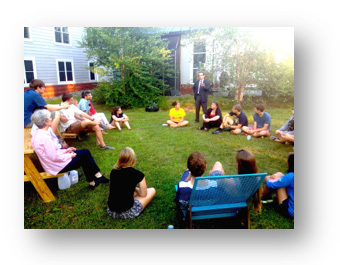 The Ecological Design Collaboratory is an initiative at GreenHouse Residential Learning Community, jointly funded by the Henry David Thoreau Foundation and the Rubenstein School of Environment & Natural Resources at the University of Vermont. At the heart of this initiative is the goal of providing several hundred undergraduates from a diversity of majors with an introduction to place-based ecological design and opportunities to practice the hands-on skills needed to bring their projects to fruition. Through mentorship by UVM faculty members, upper-level students, and our community partners, students will acquire the skills needed to design projects and initiatives that feature the local resources—both natural and cultural—of Burlington and the Lake Champlain Basin. 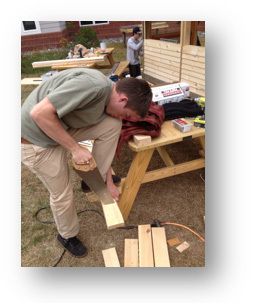 In August 2014 the Rubenstein School was very fortunate to receive funding from the Henry David Thoreau Foundation to continue the development of the Ecological Design Collaboratory at the University of Vermont. This funding has proven to be a very effective catalyst for a range of innovative educational endeavors that have allowed diverse groups of students to collaborate on design-build projects that create solutions to pressing local environmental problems. The Collaboratory started off the fall semester with a bang by undertaking an ambitious design-build project in the GreenHouse Courtyard. Under the mentorship of architect Tyler Kobick and permaculturalist Keith Morris, 10 GreenHouse students spent an intensive month coming up with innovative designs for a “food hub” structure for Burlington High School, and then ultimately building a combination sugar-shack/cider-house for their emerging agricultural campus. The lumber for the structure was sourced from the forests of Shelburne Farms, while the windows and roofing materials were sourced from the re-use zone at the Burlington Recycling Center. Many of the students had very little prior experience with hand tools (let alone constructing a building), and the project provided a great opportunity for them to gain confidence and valuable skills. It was wonderful to witness the pride they took in their work. The city’s arts district along Pine Street in the South End has been a major focus of urban planning and visioning over the past year, and a number of students from the Collaboratory have been fully engaged in the process. 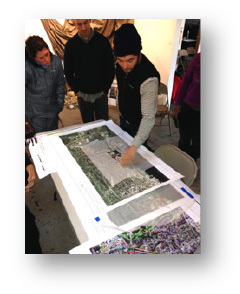 During the month of November, we hosted a series of talks and art installations at a local art gallery, and convened a three-day design charrette with students, architects, residents, and planners to envision various scenarios for continuing the transformation of the industrial landscape into a vibrant center for the arts. In addition, GreenHouse students enrolled in a 3-credit course (under the mentorship of urban planner David Hohenschau) worked with the city planning office on a series of designs that would simultaneously tackle stormwater runoff, transportation, shoreline restoration, and economic development issues. These projects have been showcased at a series of community forums this spring, and are playing an influential role in the upcoming mayoral election. 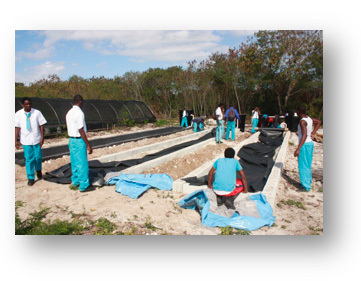 The Collaboratory’s partnership with the rural community of South Andros in the Bahamas has deepened significantly over the past few months with the design and installation of an aquaponics system on the high school campus there. During an 8-day course in January, a dozen UVM students worked alongside Bahamians to construct a closed-loop system that will link the growth of freshwater Tilapia with production of an array of vegetables including lettuce, celery, basil, tomatoes, and kale. A number of the UVM students have described the experience as “life changing,” and they are very excited about planning reciprocal experience for our Bahamian partners when a contingent from South Andros High School visits New England this summer. In addition to coming to Vermont, the emerging plan is for them to also visit Tufts University, Lesley University, and Woods Hole, where we have Collaboratory partners working with us in South Andros. We are particularly excited about facilitating the exchange of ideas and students between high schools in both countries, and our focus on food systems in proving to be a great focal area. The inaugural year of our partnership with UVM’s School of Engineering has been very successful, and we are excited to be serving as a valuable bridge between engineering and ecological design. Thirteen first-year engineering students are involved, and several engineering faculty (including the dean) have come to GreenHouse to meet with these students and mentor them on various projects. We are particularly pleased about the role that engineers are playing in advancing the design of various phosphorus-recycling technologies. One group is currently assessing the performance of several locally available materials as phosphorus-binding filter substrates that could be used for either removing excess phosphorus from impacted surface waters or recovering phosphorus from point sources, like wastewater facilities. This spring, the Ecological Engineers will be re-launching the Lake Restorer research station at Shelburne Pond. After setting up and testing the solar panels, battery bank, and pump arrays, they we will then begin a growing-season study on the ability of Lake Restorers to remove phosphorus from a eutrophic water body. The Lake Restorers are ecologically designed, floating platforms for the in-situ conversion of Phosphorous from impacted waters into fertilizer and hydroponic crops. The students plan to evaluate the contribution of plants, sediments that may form, and phosphorus-binding filter media to impacting the overall phosphorus levels in the effluent water. They will also track the crop yields, as these could potentially offset the cost of building restorers on a large scale. With the success of our pilot year, the School of Engineering is busily promoting the program with newly admitted students, and we are looking forward to having a robust second year of the program when the new students arrive on campus this fall. 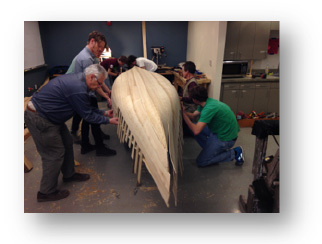 When Jen Galvin told me about the boat-building project she is involved with in New York City, I was inspired to try something similar here at UVM. Under the mentorship of a skilled craftsman, a group of GreenHouse students is currently building a traditional canoe out of northern white cedar we recently harvested with Marshall Webb at Shelburne Farms. Each of the 10 students is also making a paddle out of spruce that they will be able to keep. We plan to use the canoe regularly at nearby Shelburne Pond, where there is a rich history of indigenous people building and using canoes for hundreds of years. With the completion of the new design library, design studio, and indoor workshop this past fall, we have begun turning our attention to the restoration of the Green Roof and Courtyard at the GreenHouse Facility. 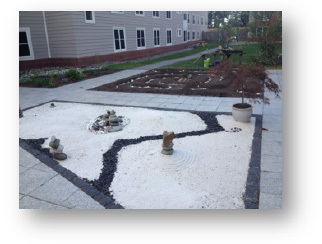 Students have been working with a mentor who specializes in medicinal plant gardening to transform the beds into spaces for aromatic herbs, medicinal plants, and Zen sculptures. When the snow finally melts, we plan to continue these projects and order new plants for use in summer and fall ethnobotany courses. Next year we hope to complete the transformation of the Courtyard into an outdoor classroom and workshop area. We are very grateful to the Thoreau Foundation for so generously funding these and other projects over the past year. The Ecological Design Collaboratory is having very positive impacts on the lives of our students and the culture of the University. The Ecological Design Collaboratory, located in the GreenHouse Residential Learning Community, is open for visits to look in to the workshop space in Room 9. Currently, there is an art installation featuring prints on display from Davis Te Selle and from students from Susan Bray's Environmental Art course. 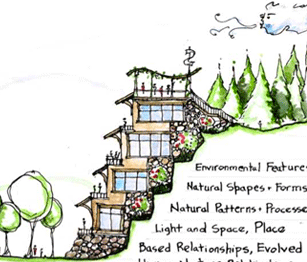 If you would like to visit the Ecological Design Collaboratory, please contact Walter Poleman.